The village of Dornoch lies within the county of Sutherland in the Scottish highlands. Two men from Sutherland, Messrs Angus Matheson and Alexander Macintosh, were amongst the first inhabitants of an area that we now call Highgate Hill, and it was they who named Dornoch Terrace after the little village from which Matheson originated. Alexander Macintosh built a house on the land he owned on Dornoch Terrace, and he called the house Kinauld after his old home in Sutherland. This first Kinauld was a long, low timber house, and Mr Macintosh lived in it until his death in 1877. The Scots connection then came to the fore again, because Macintosh's widow decided to build a new dwelling on their land, and she engaged the services of another Scottish neighbour, the architect AB Wilson. This house is the Kinauld that is still present on Dornoch Terrace, and here is a photograph of it from 1996. At the rear of the house the land slopes downwards, and blasting was necessary to make room for the new residence. Rock residue from the blasting was then used to terrace the land. Kinauld II was also constructed from timber, with plaster interior walls and cedar doors and fittings. 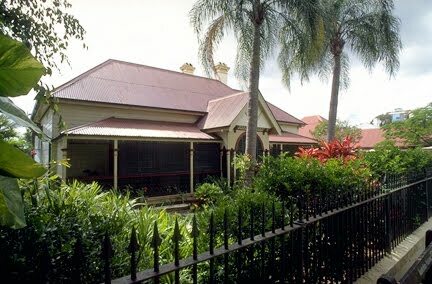 In 1932, The Queenslander called it "one of the best finished houses in Brisbane" in its series of Brisbane's Historical Homes. Although not evident from my recent pictures, the house is quite large. Four bedrooms, a sitting room, a writing room, a dining room, maid's room, kitchen and storeroom and a bathroom were all included at the time of construction. The Macintosh family owned the house until 1953. Subsequent owners made alterations to the interior, removing plaster and cedar, fireplaces and stained glass. The building was converted into flats at one stage. However, recent owners, in conjunction with architect Robert Riddel, set about restoring the residence, as well as making additions in keeping with the original design of the house.